Last month, we provided some suggestions for finding new cigars. New cigar smokers might get the most out of those tips, but they are lessons even cigar veterans can benefit from. Similarly, though these five suggestions are aimed primarily at those who’ve recently taken up cigars, I sometimes feel we’re all new smokers at some time or other. I still get a rush walking into a large, well-stocked humidor and a feeling of anticipation lighting up a cigar I’ve not tried before or wondering what experience I’ll find from different tobaccos. 1. Keep your mouth wet. Your taste buds won’t work as well when they’ve dried out. If you’re looking for something that won’t affect the cigar’s flavors try water or club soda. 2. Take time to make sure you have an even light on the cigar’s foot. Keep an eye on the burn as it progresses. If it gets uneven, you won’t experience the cigar the way it was intended. 3. If you find yourself in the proverbial smoke-filled room (and you’re not handing out highway contracts), step out periodically for some fresh air. 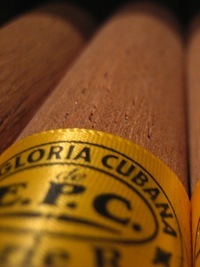 Too much smoke can overload your senses and dull the experience of your cigar. 4. Try a V-cut or punch when smoking short- or mixed-filler cigars. This can limit the bits of tobacco that end up on your tongue. 5. Enjoy yourself. This might sound silly. But remember that cigar smoking is a hobby of pleasure, not accomplishment. The number of hot new releases you acquire, the size of your humidor, the money you spend or save…all this and more is meaningless unless you find enjoyment in the cigars you smoke.